Make the most of your circumstances. No one has everything and everyone has something of sorrow intermingled with the gladness of life. The trick is to make the laughter outweigh the tears. Don’t take yourself too seriously. You can’t please everybody; don’t let criticism worry you. Do the things you enjoy doing, but stay out of debt. Don’t borrow trouble. Imaginary things are harder to bear than the actual ones. Since hate poisons the soul, do not cherish enmities and grudges. Don’t spend your life brooding over sorrows and mistakes. Don’t be one who never gets over things. Keep busy at something. A very busy person never has time to be unhappy. While I think this list is very wise, I would make some changes to number 9. Staying busy, being productive, and working toward goals can indeed make us very happy. Research shows that goal achievement can even increase hope in people who have become hopeless, decrease depression, and give people a renewed sense of purpose. Although all of this is great stuff, being too busy can create anxiety and actually decrease joy in life. Being too busy can cause us to miss the seemingly small things in life that we will one day look back on and realize weren’t so small after all. Slowing down enough to appreciate the flowers blooming outside your window. Taking the time to throw the ball with your 7-year-old child. Smelling the scent in the air after the first spring rain. Noticing your breath. Calming your mind. Observing your toddler’s eyes as they follow a butterfly. While staying busy is important, so is being mindful of the here and now and waking up to the magic that surrounds us. 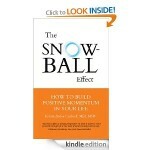 In my book, The Snowball Effect: How to Build Positive Momentum in Your Life, I quoted Dale Carnegie. I suppose like so much in life, it really boils down to balance. Being busy enough to feel productive and give our minds a break from distress, but still enough to appreciate the good things that surround us. Now it’s your turn. What is your prescription for happiness? 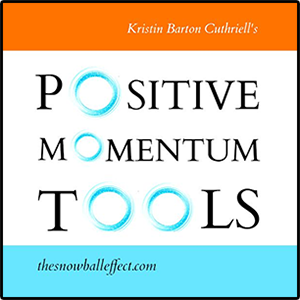 This post was written by Kristin Barton Cuthriell MEd, MSW, LCSW. 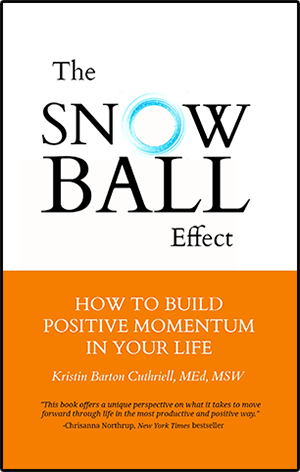 Kristin is an educator, licensed psychotherapist, and author of The Snowball Effect: How to Build Positive Momentum in Your Life.